Is An Outpost of Progress a film about colonialism, about the adventurous members of the expeditions in Africa in the 19th century or about the European civilizing mission? 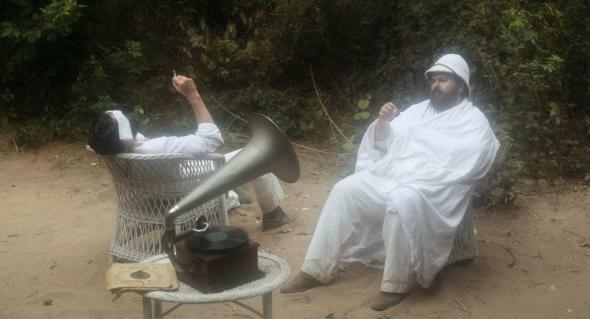 The film is mostly about Portuguese colonialism, which in part reflects the European civilizing ideology at the time, but also contains very particular features, because in the 19th century Portugal’s presence in Africa had been going on for around 400 years. By the end of the 19th century, Portugal began importing into its colonies the new Anglo-Saxon models regarding “progress” and “civilization”. At first these seemed odd to Portugal’s traditional form of presence in Africa. 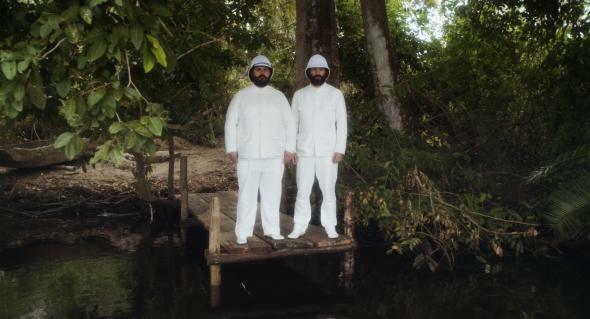 The two main characters of this film, João de Mattos and Sant’anna, represent that generation of Portuguese people for whom, in the light of that new mentality, central Africa gradually becomes a place of “incomprehension”, thus leaving them at a crossroads identity-wise. My version also focuses on how the memory of the ancient relations between the Portuguese and the Congolese was repressed by this new generation. These repressions (yet very common in Portuguese history) favor the emergence of phantasms. In this film it is precisely the ghosts of that forgotten past that emerge from Congo’s rainforest to haunt the Portuguese. And the ghosts relate to that common history: slavery, the inquisition (which existed in the tropics as well), the Congolese cultural idiosyncrasy and its icons… essentially a long amnesiac cloak that has lasted to this day. One of the most interesting aspects of the film is that it is a chamber film, a huis clos set in Africa, a continent we always think about in terms of wide open areas, endless jungles, and unknown territorial limits. Would you care to comment? I worked in central Africa in the tropical and sub-tropical areas, along the Congo River, a place with impenetrable and labyrinthine jungles inhabited by the Kongo peoples to the north and south, in their ethnical variety and complexity. It is an area that, in the late 19th century, was divided by the geometrically drawn borders of modern colonialism. Africa before “Berlin Conference” (1984) is full of kingdoms and potentates. In the early 19th century, for instance, in order to trade with kings and chiefs located in the hinterland, a Portuguese trader departing from the coast as usual would have to cross dozens of borders and pay tribute to the local chiefs before he reached his destination. This form of trade lasted 400 years and was a means to ensure that the local governance structures were maintained. From the 19th century onward, with the arrival of the new European colonial powers, and with the effective territorial occupation, a sort of physical, social and cultural “ground-levelling” took place and led to the disappearance of that Africa. That’s when the idea of Africa as an empty space, without boundaries, history or memory — the “non-place” — emerges in Europe. This notion is romanticized, for example, by Conrad in Heart of Darkness, which, despite denouncing colonialism, describes Congo as a sort of mythical, wild, unsound and terrible place. On the other hand, in Conrad’s most ingenious and seminal work (in my opinion, An Outpost of Progress), the jungle is a small stage where the misunderstandings and ambiguities of the colonial relationship between colonizer and colonized are staged in a game of hide-and-seek, almost burlesque, where the African characters finally gain subjectivity. I wanted to highlight that theatrical aspect. I took a great interest in the way you explored magical thought and the cosmologies of the Congo region. And an aspect that is very well approached, in my view, is the inability by the two Portuguese traders to understand that kind of thought. In their case, irrationality comes only through madness. Do you agree? Why did you opt for giving European noble names to the Africans and dressing them in court clothes? In my free version of An Outpost of Progress, unlike the original, the present interweaves with the past, nullifying chronological time. In the same scene, in the present time of the film (late 19th century), there are ghost-like echoes of characters who were forgotten in those 400 years of relationship. There had been, since the 16th century, a Congolese kingdom with a social structure that was thoroughly copied from the Portuguese kingdom, as if in the middle of the rainforest, in the 16th century, a copy of Portugal had been built under African kings and noblemen with Portuguese names and identities. Lisboa (1956). Researcher affiliated with MEMOIRS-Children of Empire and European PostMemories at the Centre for Social Studies at the University of Coimbra. He is also a cultural programmer. His most recent work is entitled Africa, the Four Rivers, the Representation of Africa through European and American Travel Literature, Edições Afrontamento, 2017.